Myelomeningocele is one among the most common forms of spinal dysraphism. We report a newborn male child with leaking myelomeningocele who presented with apneic spells. He underwent a magnetic resonance imaging of the neuraxis, which revealed Chiari malformation and severe hydromyelia along with pneumocephalus. He was planned to undergo urgent repair of the neural tube defect but his parents were not willing for surgery. We report this case as spontaneous pneumocephalus secondary to open neural tube defect, which is very rare and sparsely reported. A newborn male child was referred to our department from the in-hospital newborn intensive care. He was detected to have a leaking myelomeningocele. A detailed neurologic examination revealed poor tone in his lower limbs and sphincters. No spontaneous movements were observed in his lower limbs. He had brief apneic spells, which was noted since his birth. He was advised to undergo a magnetic resonance imaging (MRI) of the neuraxis. The MRI of the brain showed pneumocephalus in the right temporal horn of the lateral ventricle and also in the anterior portion of the lateral ventricle [Figure 1]A and B]. Imaging of the spine confirmed his low-lying conus and open neural tube defect in the sacral region. Along with this finding, he had severe hydromyelia and cerebellar tonsil herniation in the cervicomedullary junction suggestive of Chiari malformation More Detailss [[Figure 2]. He was planned for an emergency closure of the neural tube defect when he suddenly had an apneic spell followed by cardiac arrest. He went into ventilatory support. He was gradually weaned off from ventilator and was well after that. The leaking myelomeningocele healed by epithelization. He is planned for foramen magnum decompression and repair of myelomeningocele but his parents are not willing for any procedure. The exact incidence of pneumocephalus in myelomeningocele cannot be estimated owing to the rarity of this phenomenon. Only few case reports have been describing this finding in the literature.,,,, The finding of hydromyelia and spontaneous pneumocephalus has been reported previously only in one case. This is probably only the second case in the literature where this association is reported. Erol and Kaplan reported a similar case of apnea in a child with spontaneous pneumocephalus and Chiari malformations but it is unclear whether the child had hydromyelia. The respiratory complications of Chiari malformations have been well described in the literature., The poor respiratory effort is due to the hypoplastic lower cranial nerve nuclei and depressed brain stem respiratory centers and ascending reticular-activating system. The mechanism of air in the ventricular system is attributed to the “reverse bottle effect,” wherein the air enters the subarachnoid space and travels up through the spinal canal to reach the ventricles. This air might be sucked in to the spinal canal when the child cries. The raised intracranial pressure during crying allows the egress of the cerebrospinal fluid (CSF) out of the ventricles. This is followed by the development of negative pressure during deep inspirations, which allows the air to be sucked in. This air can be a source of bacteria and lead to bacterial meningitis. This complication had been reported in two, of the five reported cases of spontaneous pneumocephalus and had resulted in the death of the infant. However, our patient was investigated for the occurrence of this complication but his CSF was sterile. The occurrence of pneumocephalus in open myelomeningocele should prompt urgent measures to close the defect. In the presence of apneic spells, urgent decompression of the brain stem is warranted. This can lead to brief recovery, but as this complication is due to dysfunctional brain stem nuclei, long-term poor outcome is expected. 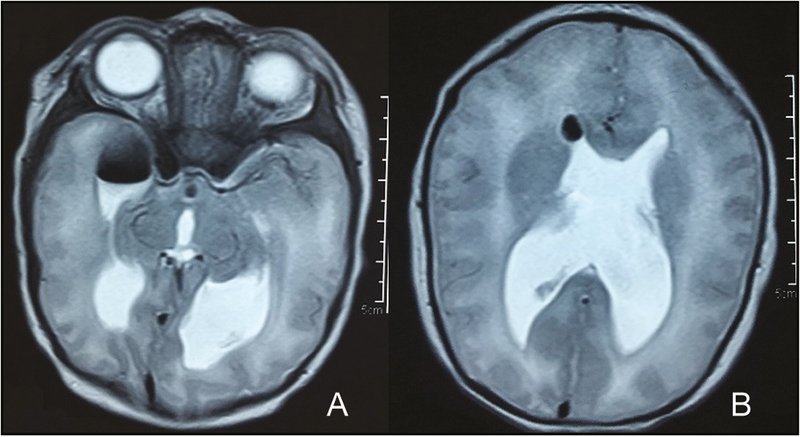 Oda S, Shimoda M, Hoshikawa K, Shiramizu H, Matsumae M. Organized chronic subdural haematoma with a thick calcified inner membrane successfully treated by surgery: a case report. Tokai J Exp Clin Med 2010;13:85-8. Trawöger R, Strasser K, Ellemunter H, Gassner I. Spontaneous pneumocephalus in a newborn infant with myelomeningocele and hydromyelia. Dev Med Child Neurol 1994;13:924-7. Garonzik IM, Samdani AF, Carson BS, Avellino AM. Pneumocephalus in a newborn with an open myelomeningocele. Pediatr Neurosurg 2001;13:334. Erol FS, Kaplan M. Spontaneous pneumocephalus presenting with apnea attacks in a newborn with open myelomeningocele. Pediatr Neurosurg 2004;13:312-3. Odemis E, Aslan Y. Spontaneous pneumocephalus associated with open myelomeningocele. Indian Pediatr 2004;13:289-90. Portier F, Marianowski R, Morisseau-Durand MP, Zerah M, Manac’h Y. Respiratory obstruction as a sign of brainstem dysfunction in infants with Chiari malformations. Int J Pediatr Otorhinolaryngol 2001;13:195-202. Tran K, Hukins CA. Obstructive and central sleep apnoea in Arnold-Chiari malformation: resolution following surgical decompression. Sleep Breath 2011;13:611-3. Shiihara T, Shimizu Y, Mitsui T, Saitoh E, Sato S. Isolated sleep apnea due to Chiari type I malformation and syringomyelia. Pediatr Neurol 1995;13:266-7.